Garlic is the most important ingredient in this baked mussels. 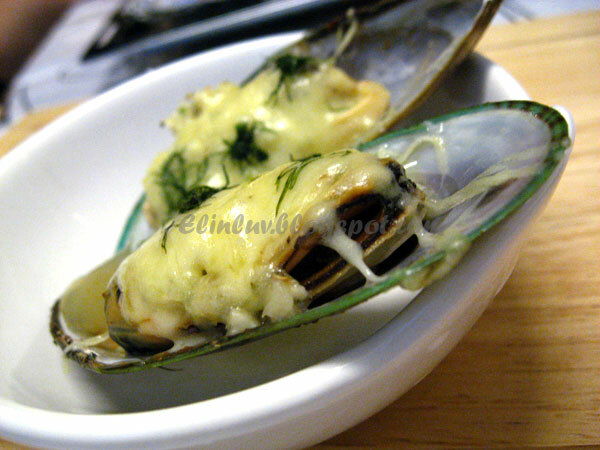 Chopped garlic mixed with dried italian mixed herbs and olive oil makes the magic potent for the mussels...and the grated mozzarella cheese and dill makes it even more flavorful. stir frying them with the seafood sauces. Jo and myself can't wait to savor them..LOL! Preheat oven to 200C. 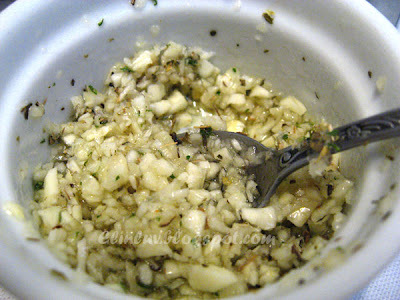 Mix ingredients A together in a bowl and leave aside. Lay the mussels in rows on a baking tray lined with aluminium foil. 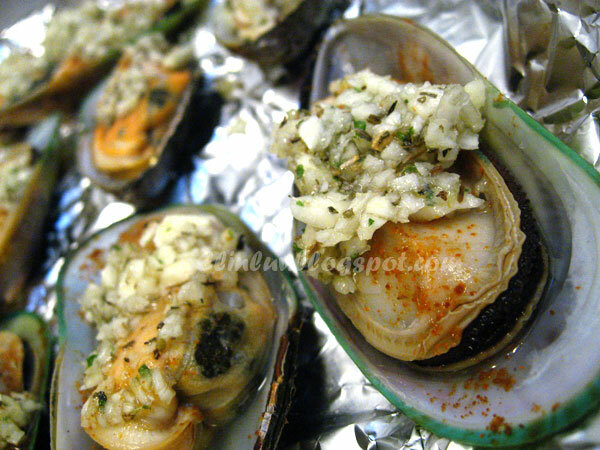 Sprinkle salt and cayenne pepper on the mussels. Scoop a heaped tsp of mixture A on each mussel. 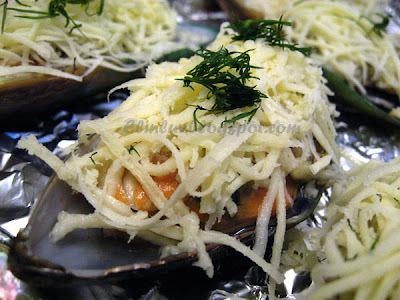 Cover each mussel with grated cheese and garnish with the chopped dills. Repeat this process on all the mussels. Enjoy and Happy Holidays to all ! Wow! I love the combination of garlic and cheese. They looked really good too! I bet they must smell amazing when they come out of oven! If you added some fresh breadcrumbs to the grated cheese and dill it would make a very nice crunchy topping on your mussels. I love meaty NZ mussels too! 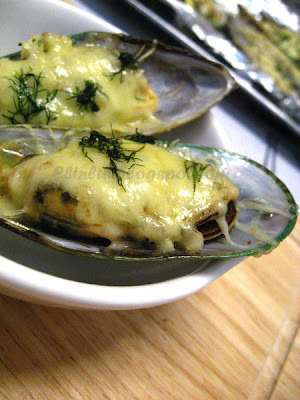 The cheese make the mussels look so tempting. Yum yum! 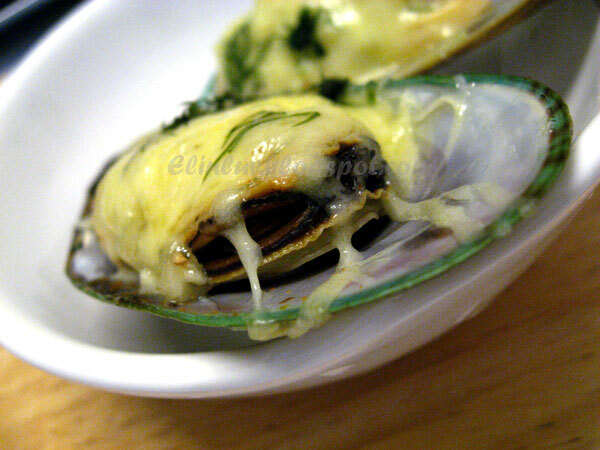 I absolutely LOVE New Zealand Mussels! They're so meaty and have that sweetness to them! Ai!!! Thank you so much for sharing your recipe; I'd definitely want it for a starter, too! 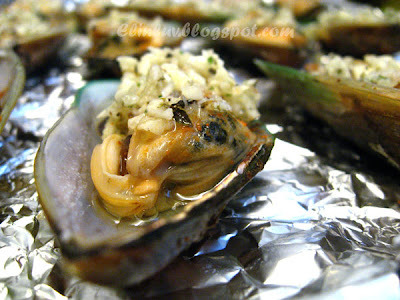 yummy .. i like oysters in any way they are baked with cheese. great day to you!! 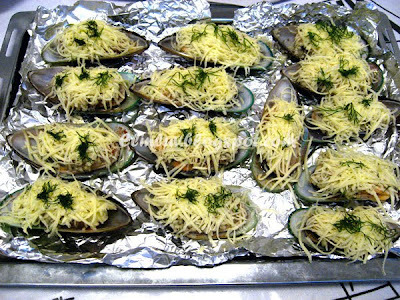 Elin, these cheesy baked mussels look marvelous! Your recipe looks delicious, and the New Zealand Mussels are beautiful with their green shells. The combination of the baked mozzarella & garlic must put it over the top! I'll have to try this with our local Blue Mussels.